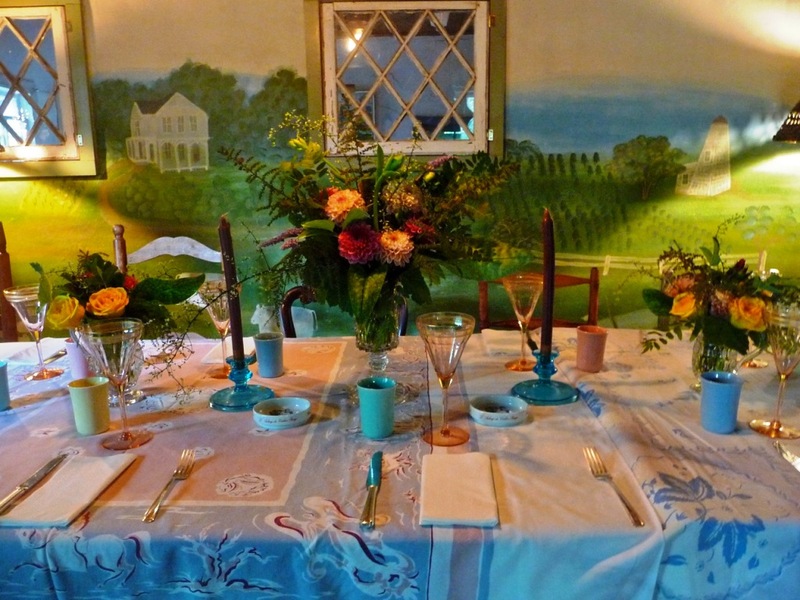 A lovely table arrangement where the vases seem to blend into the primitive wall mural of Orient, New York . . . as imagined and painted by Skip many years ago. Last April 2012, I wrote about the beautiful memoir by my late friend Clyde “Skip” Wachsberger. The book is called Into the Garden With Charles. It was first published privately by friends of Skip’s (under the guidance of editor and friend Karen Braziller) in December 2010. Farrar, Straus and Giroux published it commercially in early 2012, although Skip did not live to see that event. Read more about the book here. I have not been able to visit Orient, New York, or see Charles Dean, Skip’s surviving husband, since January 2012, when I traveled there for the memorial service honoring Skip’s life. I love this place and all of the friends I’ve met through these two men. The garden during summertime at Adsworthy, where Skip and Charles made their home, is very special. And for some reason, my trips in recent years were during fall or winter, so I hadn’t toured that verdant place during its peak since 2005 or so. Too long! Last week I was fortunate to return for a mere 36 hours. It wasn’t nearly enough time, but every moment was filled with wonder, delight, friendship and memories. One of the highlights was getting ready for a big, yummy, community dinner prepared by the man Charles has now found to spend his life with. That is Charles’s very personal story to tell, so I won’t say more. I’ll only add that he is now with a dear, charming person and I’m pleased to see Charles so happy. Skip’s presence is still very much evident in his garden. I was mindful of his exuberant spirit watching over me as I snipped stems, leaves and flowers from uncommon specimens that he originally selected, planted and tended to over the years. The opportunity to create the centerpieces for our wonderful dinner party was all the more special for the connection I felt between those plants and Skip. 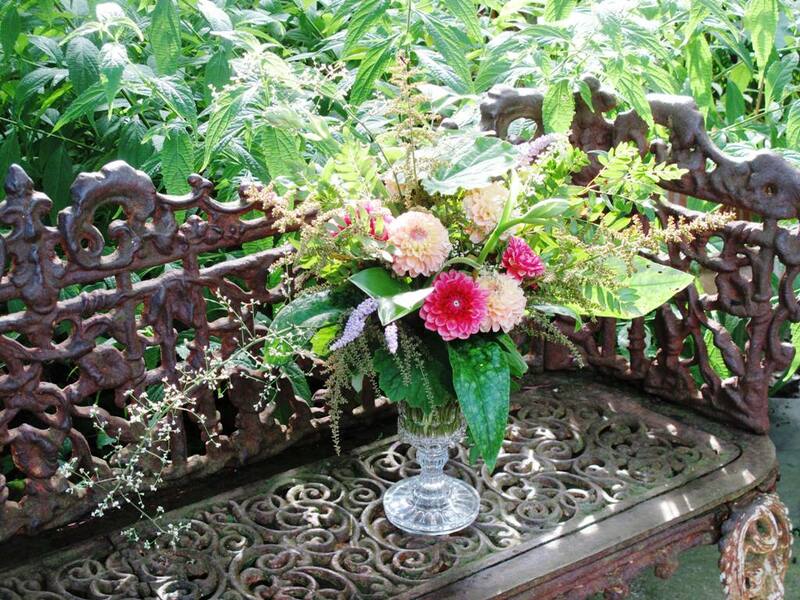 While the bouquets’ dahlias came from a local flower farm stand and the yellow roses were a gift to Charles from a family friend visiting his sister, artist Frieda Dean, everything else came from Skip’s garden. I relied on his plants for bold and fine foliage, tiny buds, fern fronds and seed heads. Charles supplied the beautiful cut glass urn and two small cream pitchers for the vases. Our table sparkled with vintage linens, pottery, silver and stemware. You can see how it looked above. 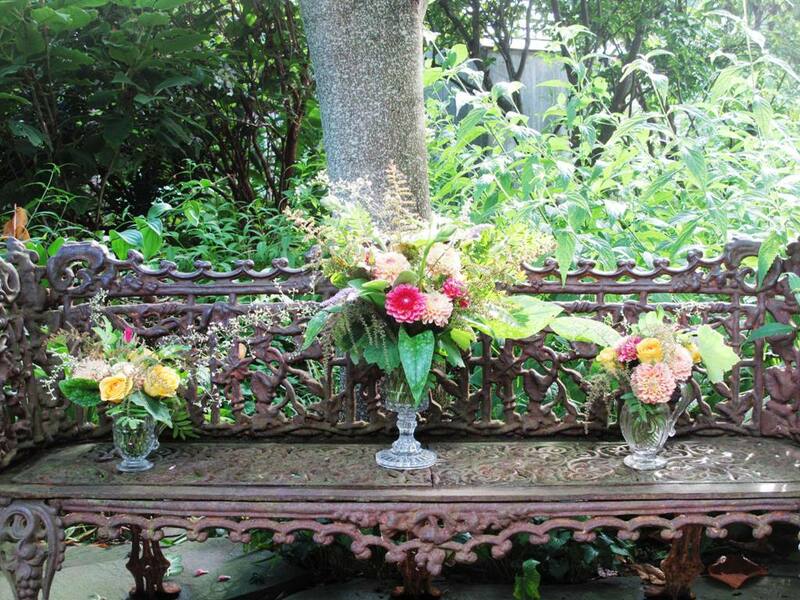 A still life with three bouquets, on a vintage cast-iron bench in the garden. 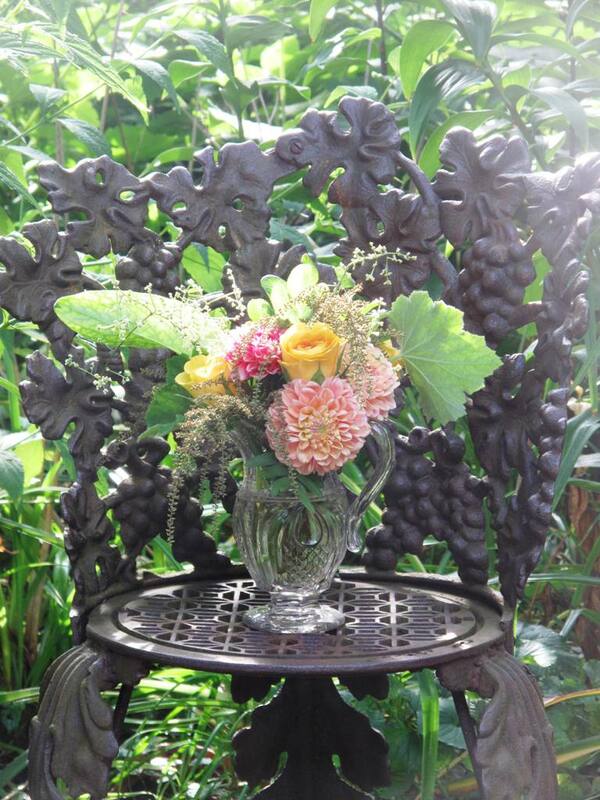 A small glass pitcher looks so beautiful in the dappled light that spills onto an iron garden chair. The larger vase features all sorts of gorgeous leaves, fronds and stems from Skip’s garden. This entry was posted on Wednesday, August 28th, 2013 at 8:39 pm	and is filed under American Grown, Book reviews, Creativity, floral design, Gardening, General, Landscape Design, Plants, Playfulness, Spiritual Practices, Writing. You can follow any responses to this entry through the RSS 2.0 feed. You can leave a response, or trackback from your own site.